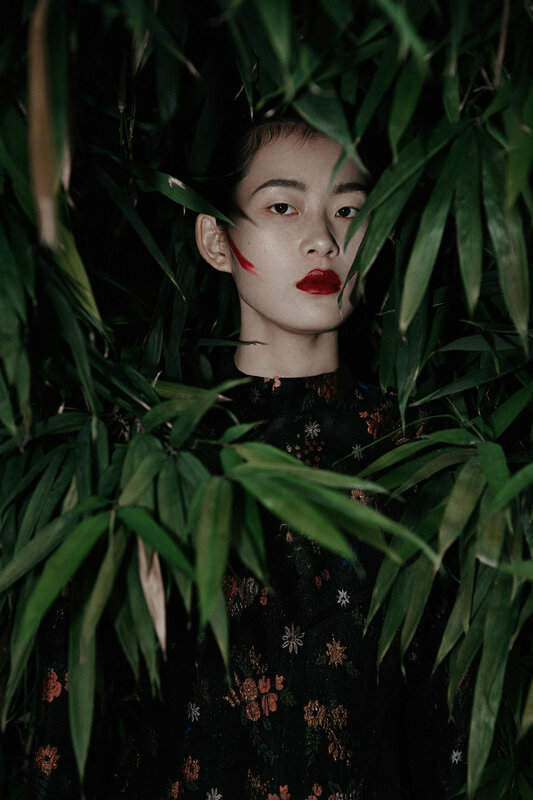 Crouching Tiger, Hidden Dragon is a story shot by Zhang Wei, styled by Liu Ruijia, with makeup and hair done by Irina Liu, featuring a model Liao Yan. 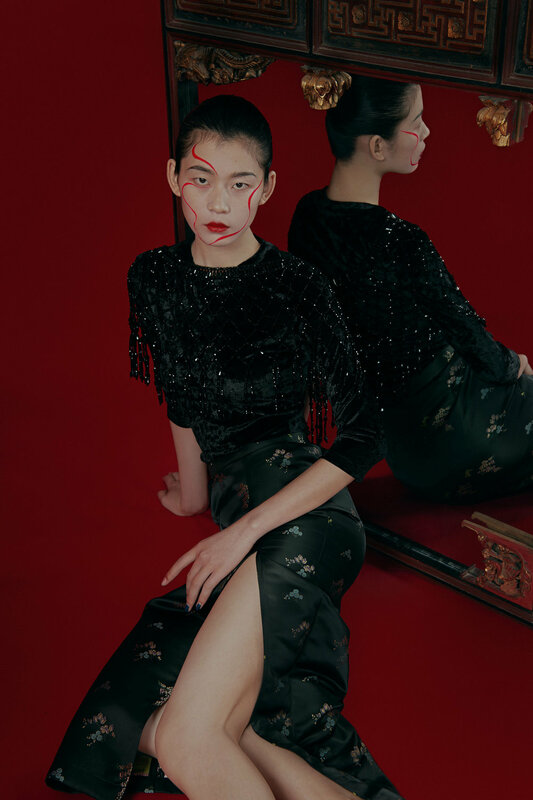 Exquisite aesthetics of Chinese culture is delicately crafted into the shoot with the thematic color choices of deep red and green, the architectural background, plants, style, and makeup. Frames captivate the gaze and seize attention with several low angles, strong portraits, symmetry, straight lines of the objects, and a balance between live and inert elements. Makeup is visionary, innovative, the face is approached as a canvas for the master to create on. The character maintains the calmness of postures in the gorgeous, elegant garments yet the eyes tell a much more complicated story of inner feelings and a personal perspective on the surrounding details. "The tiger and dragon in our shoot symbolize two typical forms of Chinese artistic composition, Blank Art and Window Frame". What is the main idea behind the shoot and how does the Eastern concept of the tiger and dragon’s characteristics applied here? Zhang Wei: Crouching Tiger, Hidden Dragon, a remarkable Eastern film directed by Ang Lee, has a very classic aesthetic of China. The tiger and dragon in our shoot symbolize two typical forms of Chinese artistic composition, Blank Art and Window Frame. Blank Art is an intentionally left white space in the photo. Window Frame is a particular picture made from holes. Also, Crouching Tiger, Hidden Dragon has to do with the traditional Chinese idiom which describes a place full of talented or extraordinary people who remain hidden and undiscovered, or simply put "talented or extraordinary people hidden from view". I applied this meaning to direct the mood of the model. I wanted the model to bring a little bit of momentum coming from the quiet inner calmness, but the momentum couldn't be too aggressive. Because the combination of firmness and softness is the attitude that people like, I let the model act with a soft temperament with a little bit of determination in the eyes to create this atmosphere. The makeup techniques are uniquely and creatively crafted to the story, as the symbolic red figure shaped repeating the eye lines in an almost Yin Yang concept, the earing crafted on the neck of the model that creates a 3D effect of the real thing, the enlarged and reshaped red lips. Tell about the technicality and the inspiration for those ideas. Irina Liu: Red is a very strong statement for Chinese culture. So red was chosen to be the main color for the whole story. As we know, TaiJi diagram symbolizes the Chinese philosophy. I interpret those curved lines in an artistic way, putting on the model’s face which is a canvas. With the 3D effect earring, the stylist wants to convey that modern technology could harmonize with traditional beauty aesthetics. Also, this idea could be seen as a young creative translating classical culture in their own modern language. "The colors and setting in this editorial are inspired by the classic Chinese color palette, aiming to create a theme of integrity". Where did the shoot take place? Let’s speak about the artistic decisions to have a colorful background material, the traditional flora, and the outtakes of the building that add to the atmosphere of the shoot. Irina Liu: We chose Zhongshan Park in Xiamen as the shooting place because Xiamen is a typical example of Min Nan culture and reservation city. (Min Nan culture is a regional culture of China, has great influence in Southeast China). The colors and setting in this editorial are inspired by the classic Chinese color palette, aiming to create a theme of integrity. What was the most important part in directing the model for the portraits, the emotions, and the mood to produce in the photos? Zhang Wei: Communication should be the most important part in directing a model. In the beginning, we need the model to relax and know well the storyline for the shoot. During the shooting, the model transforms to an actress, the body even the postures need to have their own storytelling language.